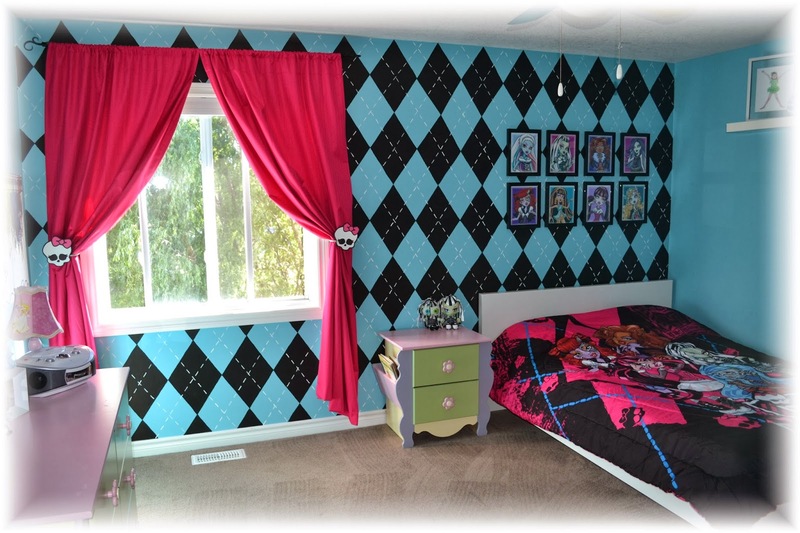 Cake Momma: The Monster High Bedroom! Time to change up my little girls room! 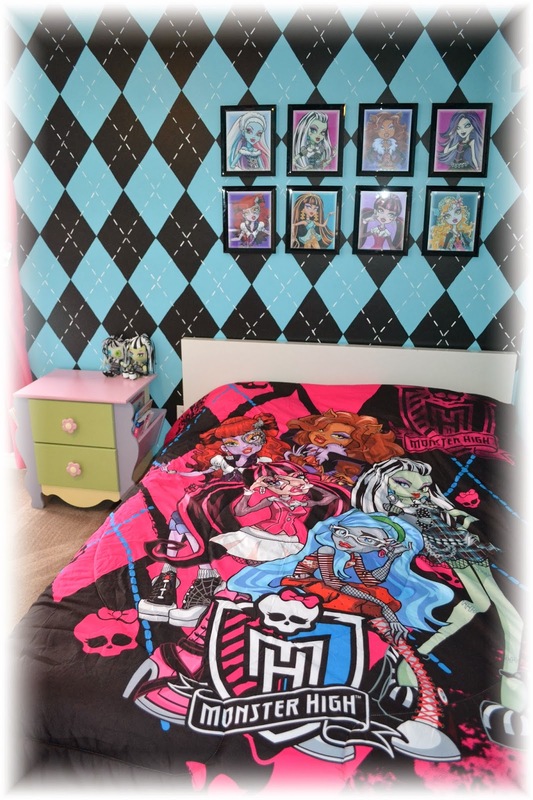 A little monster high action for this room! For the back wall I used a diamond template the trace. After the black diamonds were painted on the wall I went back with a fine paint brush and did the white dotted lines by free-hand! It really is a powerful feature wall! The pictures I got off the internet and just adjusted the background colours with a photo program. The picture frames I bought at the dollar store! 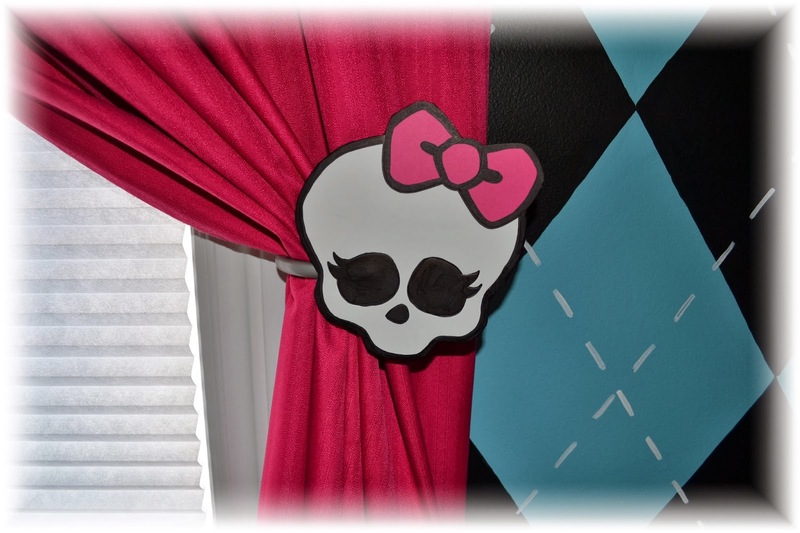 For the curtain tie backs I removed the balls that were on the ends of the original brackets and made the monster high skulls out of thick foam core! I punched a hole through the sides and used a hot glue gun to attach them to the brackets! They are actually very strong and it's been almost a year since we made these and they are still in excellent condition! 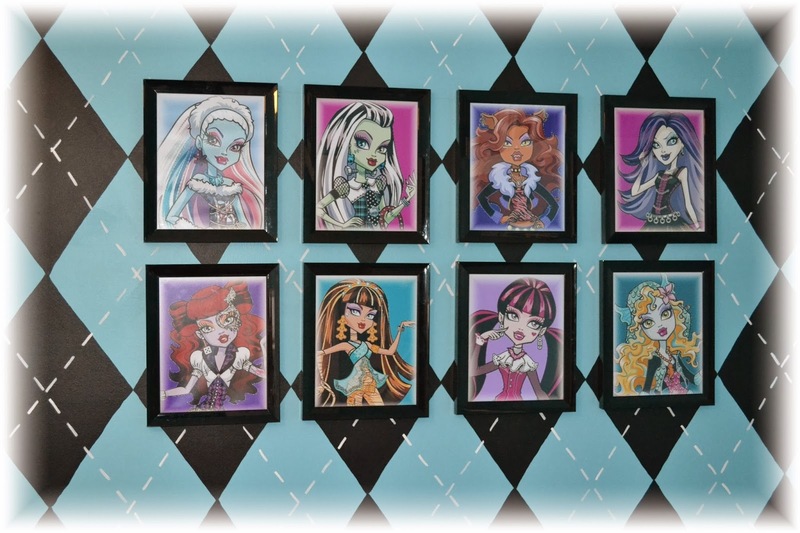 And the final element to my little girls room is her giant monster high doll house! You can find the details on how this doll house was made in one of my older posts! She loves her room and I think that it came together just perfect! Love this!!! What color blue did you use and from where? Hey I love your dollhouse, was that inspired by our Skull Academy, if so, I would love to share it on our blogs and videos. Thank you!!! YES it is from your tutorial!!! Thank you soooooooo much!!! I have been meaning to send you a picture and thank you since I made it - but I just keep forgetting!!! My daughter loves her doll house! Wow did it ever take a long time to make! You really have an amazing talent to be able to make the houses that you have done (and all the detail!!! wow!!) Love your work!! Yes please feel free to share it on your blogs/video :) Thank you again for taking the time to make the tutorial!!! Made my daughters day!! I am a stay at home mom who dabbles in the cake artistry world! I have two beautiful children and I love them more then anything! Staying home with them has been an amazing gift for me and I am so happy that I have been able to do this! While I adore my children I also need to express myself artistically and was lucky enough to have found a talent for decorating cakes!